mosaic artists and donated to Providence Park Hospital, Novi, Michigan. 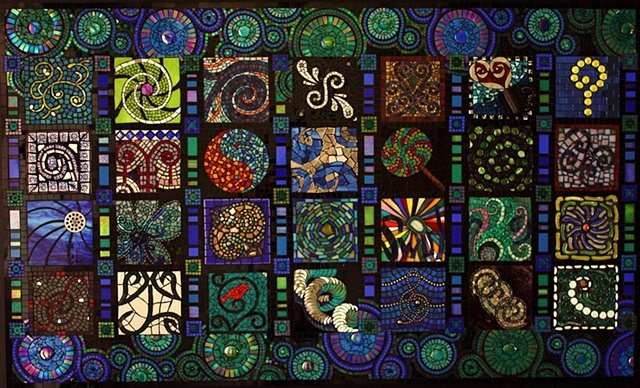 Each 6” mosaic swirl was composed on a mesh background in the individual artists’ studio and shipped to Michigan where it was then incorporated into the larger mural. The varied pieces were pulled together utilizing a fluid background of cool hued swirls. All featured Swirl pieces were created as 6”x6” squares. crystal, shell, silver, pearls) acrylic paint and mica.